Video for Herve This style Chocolate Chantilly - dairy free chocolate mousse. Posted by Keith at 9:53 a.m. I've ordered the chemicals, picked out the recipes, made a list, and the next months are to be spent cracking open pigs skulls, pressing pates, whipping up oddly flavoured spheres, caviars, and counter instinctual constructions. And working on more classical skills. Generally, adding water to warm chocolate results in a grainy, coagulating, sticky and depressing mess. Because, in small amounts, water encourages the sugars and certain other elements to clump together in larger globules, creating an uneven, clumpy and grainy end product. 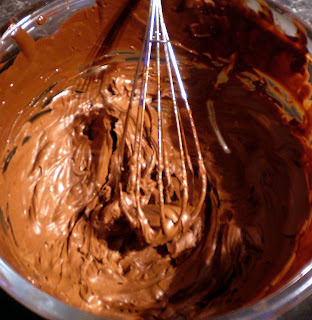 In this recipe, rather than mixing water in chocolate, chocolate is mixed in water, Think of it as an emulsion. Think of oil and water. Think of the fact that they don't mix. Except when they do. Mayonnaise. Oil is added drop by drop, and continually whisked, into egg , yolks or whites, which contain quite a lot of water can be used. The lecithin in the eggs is the emulsifier, helping bring the whole mix together and stabilise it. The whisking keeps the globules small enough for the emulsification to work. It's the same deal with a vinaigrette, with mustard often used as the emulsifier, and shaking the bottle mixing up the molecules, and keeping all those globules, or fat droplets nice and small. The vinegar contains the water. It's quick. 20 minutes from opening up a bar of chocolate to having a set mousse. No added dairy, sugar, or eggs. A really clean and intense hit of the chocolate you use. If you use Valrhona, that's what it tastes like. The taste of truffle, with the texture of mousse. If you screw it up - and I did. Just pop it back in a saucepan, and start again. I used two cheap Tesco own brand slabs of 70 percent nonsense, to work on technique. Prepare an ice bath - one bowl with ice, and a little water, and a second, smaller bowl, to sit inside this. Add the chocolate and water to a saucepan. Heat over a medium flame, stirring constantly, until the chocolate melts. Pour into the smaller bowl, and place it in the ice bath. Whisk, like billy-o, in the words of Mr Blumenthal. You should, eventually get a double cream, and then a whipped cream, consistency. Stop here. Much more and it will be over-whipped. Use an electric mixer, and finish off with a handwhisk. Because the taste of chocolate is so clean, the quality of the ingredient must be high quality. The intensity means that, except for dark chocolate fiends who consume vampirically, small amounts are the ethic. Can this work with lighter chocolates? 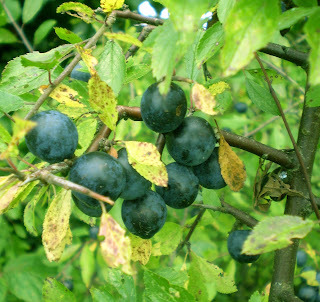 Posted by Keith at 8:16 p.m.
...blackberries, bursting with sweet and apple flavours picked glistening with rain from the bushes, fat hips blushing in crowded communion on their thorny bushes....It's been a good autumn, the late sun has brought out the best in them. 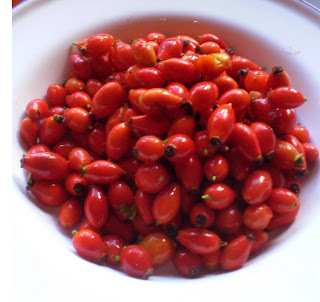 We took the harvested rosehips and made a syrup (apparently high in vitamin C). It's quite a delicate syrup, and only slightly viscous - it flows quite freely. But boosting the sugar content and boiling it for longer would help, or adding pectin (liquid, or from elderberries, crab apples) with a spot of lemon juice would too. The taste is quite floral, sweet, but not overly so. Poured over fresh melon, it was delicious, and will liven up creme brulees, panna cotta, and homemade ice-creams as the happily erupt from the winter kitchen. The works in the picking here. The making is simple in comparison. 1 kilo of rosehips, detwigged and washed in cold water. Blitz your rosehips in a blender, not to puree, but until all the hips are crushed - the video has a good shot. Pour in two litres of the water and the crushed hips into a pot. Bring to the boil. Simmer for ten minutes. Pour off the liquid - we lined a colander with muslin, and tipped the entire contents in. Reserve the liquid, and boil up the rosehips with the last litre of water. Simmer again, for ten minutes. Again, drain, using muslin and a colander, but leave to drain for a while - from one hour to overnight. Be careful not to press the pulp to drain it, you may get a cloudy syrup. After straining, add all the strained liquid to a pot, and add the sugar. 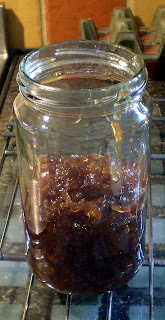 Sterilise your jars (we put ours in boiling water, and swirl them around with a fork, and lift them out onto a cloth, with the same fork. Ditto the lids. Boil your liquid for a couple of minutes (we went for 5, some recipes call for 10), and then pour directly into your jars. Screw the lids on tight - you'll need a towel to handle the hot jars, and turn upside down for two minutes or so. Posted by Keith at 10:44 a.m.
Posted by Keith at 12:21 p.m. 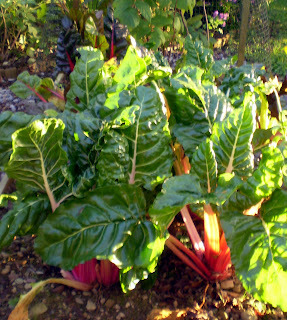 I've found 8 large leaves, harvested from the outside of the plant (twist the stalk at the base, near the ground) (thanks The Gorgeous C)(for the chard, and the tips), give just enough wilted leaf for two people. The exact ratio varies - depending on the size of your eggs, the humidity in your kitchen. We get small eggs from the chickens, so three eggs works with roughly 250g of flour. Pour the flour out into a work surface, make a volcano, pour in all or most of the eggs*. Slowly, incorporate the flour - I do this by stirring in flour from the edge of the volcano, gradually thickening the eggs. By the time the volcano collapses, the egg is thick enough to work with comfortably. The dough should come together. It won't have the elasticity or live feeling of bread dough, but it should have some elasticity, come together and stay in a ball fairly easily, and not feel crumbly, but the dough will still have creases and cracks - it won't be perfectly smooth. Wrap it, in balls, in cling film or plastic - make it airtight - if too much air gets at it, the skin of the dough might become dry, grainy and flaky. Leave in the fridge for an hour or so, and it will come together more. What comes out of the fridge will be a smoother, stiffer dough. Work it to warm it - a quick kneading, and you should have a quite dry feeling, slightly elastic yellow dough, with a very slight sheen. Voila. Perfect. Feed it through your pasta machine, going from thickest to thinnest setting. Fold it back up, rotate it 90 degrees, and out it through your machine again, from thickest to thinnest. Fold it, rotate it, and do the same again. You should have really smooth pasta now, ready for shaping. Here's a previous post, with some pics. The video is above. * I beat them first, you don't have to. You can add all the egg if you want. I keep some back in case the dough is too dry - a hangup from constantly forgetting about the small size of our eggs. If your dough is too wet, add more flour, and knead. **I find egg yolk to be more predictable here than oil, and easier to work with. Posted by Keith at 11:21 a.m.
To go with the cream cheese, served fresh on plain bread. Delicious. Also had it with last nights bangers and mash, a classic combination wth all things porcine. Cold with cheese it coils up in candied stickysweet mounds of caramelised onion, with the deep taste of port, and a little Rosemary humming just underneath everything else. 3 medium sized Red onions, very thinly sliced. As much butter as you think you need. I think I need a lot. about 50-60g is good. A generous splash of port. A large srpig of Rosemary. 2 or 3 cloves of garlic, crushed or minced. Slowly sweat the onions, garlic and rosemary in the butter until soft, and golden. About 12 to 15 minutes. Add the cider vinegar, sugar, and port, and bring to the boil. Simmer for about 30 to 40 minutes. 40 minutes gives a really thick set for your jam, 30 gives something like a syrupy consistency. Add salt and black pepper to taste. *I played around with sugar and vinegar quantities. 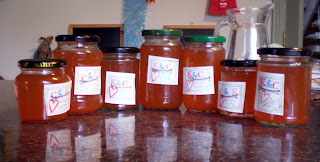 Too much sugar - I tried 120 g, overpowered the jam. Still good, but too strong for what it was accompanying - sausages. The earlier version, with the above quantity, was more balanced. The acidity, port flavours, sugar and rosemary all came through. Posted by Keith at 9:26 p.m. It's simple, quick, cheap and easy. Almost curiously unmysterious. And, with thirty minutes of your time, you can cook up a half kilo of creamy and uncomplicated deliciousness. Unsalted, unsweetened, and with no additives. 2 litres of goats cheese, badly strained, yielded about half a kilo of cream cheeese. The texture was smooth, melting nicely in the mouth, no graininess, and fatty enough to make me think about adding extra flavours to the cheese itself. It gave a smooth and sweet, not sour, hit with some light and nutty undertones. As it sat in the fridge, the taste developed, the texture bacame denser - though still creamy, and the taste...becomes cheesier. Deeper, with a hint of lactic sourness. A perfect replacement for store bought cream cheese, or Ricotta. We served it up in canneloni, with chard from the garden (recipe and video to follow), and a slow cooked sticky tomato sauce, and also straight, on homemade bread courtesy of the Gorgeous C's delightful baking art, with a sticky, sweet and ecstatic red onion jam. Mix the milk and cream together in a thick bottomed saucepan - Quite important this, as the milk may burn and stick if not. Heat to 85Degrees C. Stirring occasionally. If you don't have a thermometer, wait until you can see the milk beginning to steam a little. Heat until it hits 90 or 95 degrees (I went for 95), or until you see the curds separate from the whey - the milk will look really grainy. Strain - I scooped out the curds into a sieve, and a lot of curd slipped through the sieve. Ideally, line a sieve with cheesecloth, and filter it through this. Leave it sitting in this for several hours to drain to the consistency you want. Tip out into a bowl, and refrigerate. Or eat. Posted by Keith at 1:17 p.m.